“Stella” again in winning form – this time at the N.I. National Show! 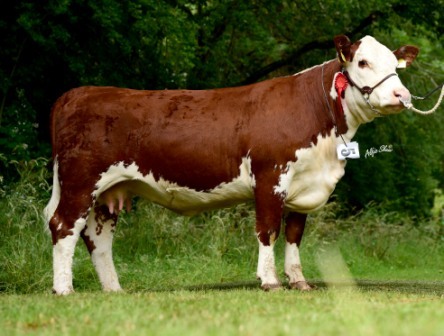 Northern Ireland Hereford Breeders pulled out all the stops to ensure that quality and quantity were on display at their Annual National Show held recently at Clogher Valley. This is one of the highlights of the calendar for Hereford breeders locally, and they were delighted to have Society President, Gerald Blandford officiating as Master Judge. 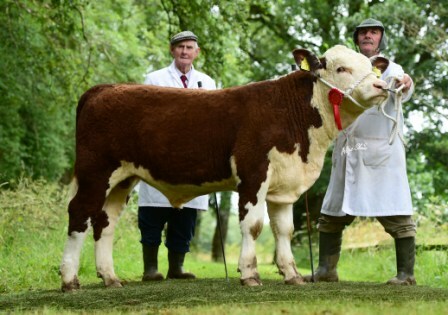 Taking home the Supreme Championship was the outstanding “Solpoll 1 Stella L2” (pictured above) bred and exhibited by John & William McMordie. This daughter of Panmure 1 Henry is no stranger to success having notched up Championship titles at the Royal Ulster, Balmoral earlier this season, and the 2014 NIHBA Calf Show. Standing by her side in the Reserve Supreme spot was her paternal sister “Solpoll 1 Starlet M12” (pictured above) also from the McMordies. 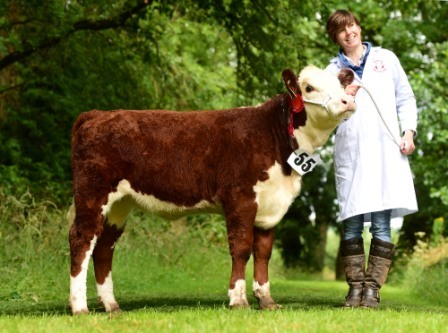 This youngster is just nine months of age, and had earlier in the day collected the Calf Championship. The Male Champion “Woodvale 1 Livewire” (pictured above) stood top of the line in a very impressive young bull class for owners Alwyn and Adam Armour, Dromara. This is the first calf bred by the County Down duo, and looks to have a promising future. The reserve male was also selected from this large class in the form of “Solpoll 1 Lawyer”. Both of these prize winners are sired by Panmure 1 Henry. The Cow Class was led by Stephen Baxter with the Lisola 1 Eddie daughter “Tarascon 1 Tilly”. This red ticket winner was accompanied by her bull calf at foot. Senior heifer class was won by another daughter of Panmure 1 Henry from J & W McMordie, with Solpoll 1 Dainty K18, shown with her young heifer calf at foot. David Wilson enjoyed good success at the National Show taking home two red tickets. The first of these was for “Lisrace Prettymaid 19th” who has previously won the Junior Female Championship at the NIHBA calf show. This January 2014 born heifer is sired by his homebred bull Lisrace Lifeliner who is a former Balmoral Champion and Bull of the Year winner. 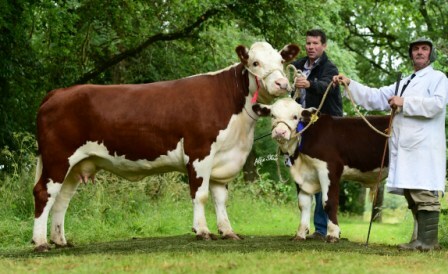 The Wilson’s second class winner was their new stock bull “Knockmountagh Master”, who is sired by Grianan Firecracker. The Junior Heifer Calf Class attracted a good entry with Kathryn Greenaway, Portadown standing top of the line for “Hilltop 1 Roberta 3rd”. This Lisola 1 Eddie daughter was born in February of this year. 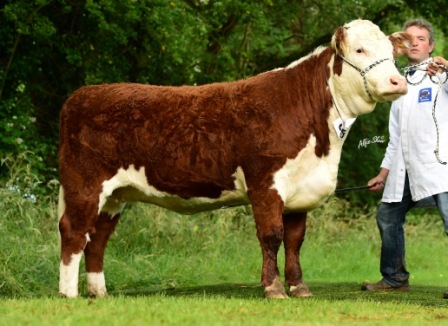 “Richmount 1 King Kong” topped the Senior Bull Class for James Graham, Portadown. This Graceland 1 Colin son was the 2014 Bull of the Year. The Senior Bull Calf section was headed by “Dreemore Titanic” exhibited by C & R Pogue. Fingerpost Apache is the sire behind this young prospect. 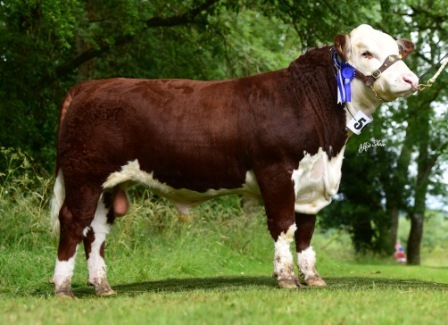 The final male class went to C & M Beatty for their January ’15 born son of Cloncullane Esquire. PJ Budler, South Africa congratulates Adam Armour on winning the young handlers section at the National Hereford Show. The busy ringside of spectators were highly impressed with the bumper entry of Hereford cattle forward for the National Show, with big classes giving them plenty to keep them entertained right from start to finish. 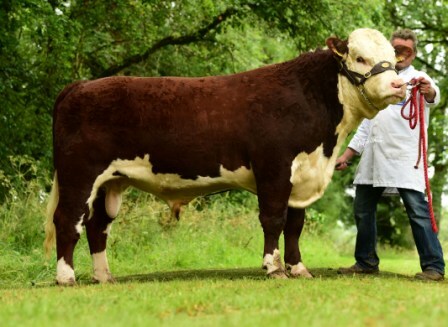 The Judge reinforced this when he described the Champion as “exceptional amongst a tremendous show of cattle”. Report by Libby Clarke and Photographs by Alfie Shaw.